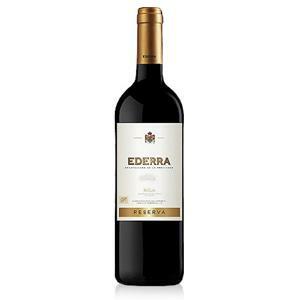 Aged for 12 months in American oak barrel, this fantastic Ederra Rioja Reserva pairs well with red meats, game dishes, roasts, poultry, white meat, ham, sausages, cured cheeses and blue cheeses. Nose: Red fruit, characteristics of tempranillo which bind together. Toasted spicy notes also feature from the barrel aging. Palate: Soft tannins, "velvet" with good fescura, elegance and length. Ruby red with red fruit flavours which are characteristic of Tempranillo, underlain with spicy and toasty notes from ageing in barrels.